This error occurs when there is no signal from the icing fan motor to the main control board for longer than 114 seconds. If you see the code on the display, please, check the fan in the back of the freezer. The fan’s mission is blowing air toward the ice maker. In some cases, the error can be cleared by unplugging a refrigerator and plugging it back after about 5 minutes. Should the problem come back, it means that the fan is not running. This may be caused by ice building up and blocking the rotation. In this case, general defrosting should work: unplug the fridge for a day or so and let all the ice melt. This error code reports a defrost heater problem. However, do not be in a hurry to look for a new heater: this may also be a control board issue. If it is not, you should get to the defrost heater. Unplug your fridge and take all bins and baskets out of it. Then remove the front freezer panel using a flat-head screwdriver. Check the defrost heater and evaporator coils. Remove the heater very carefully. Do not apply force to the coils! Replace the heater and run the refrigerator. This error code stands for ‘communication error’ and occurs due to communication failure between the main control board (on the back panel) and display control board (on the freezer door). This may be due to poor wiring and/or loose connection. Remove the cover, check the main control board and the CON6 connector (see the diagram on the second image below). If there is no wiring problem, check the wire harness n in the upper part of the left-hand door of your fridge. If no problems occur there, check the dispenser and its wire harness connection. Why it happens: there is no signal from the icing fan motor to the main control box for over 114 seconds. Locate it: check the freezer fan, which forces air to the ice maker compartment. It is found in the rear section of the refrigerator. What to do about it: unplug your refrigerator and wait for 5 minutes. Then plug it back in. If the code is still there, the fan is just not running. Most likely, it is iced up. If it is, you have to defrost the fridge. Unplug it for 24 hours and wait until all ice melts. If the defrosting does not work, you may need to replace the fan. Why it happens: the evaporator fan or main control board is not working. Locate it: check the fan motor, main control board and wiring harness. Sometimes the problem disappears after a simple power reset. If it reoccurs soon after the procedure, this may be due to a main control board or fan failure. Check these two parts (they are located in the rear part of the refrigerator). If the fan motor is running and the fan is spinning, replace the board. If the fan and motor are not working, replace the fan. Parts to look for: a fan motor, wiring harness, and power control board. 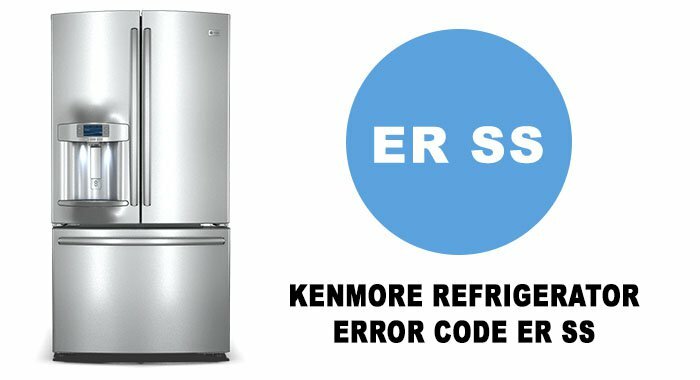 Why it happens: this error code indicates a freezer sensor problem, which may result from the sensor failure or disconnection. The latter may occur in the cabinet wiring and/or in the main control board. Locate it: unplug the refrigerator, check the blue wires at the main control board. Pay attention to connections at Terminals 11 and 12, as shown in the diagram below. If there is no problem, this may be due to a board failure. The procedure may require professional help. Parts to look for: temperature sensor, power control board and a wiring harness. Why it happens: this error code appears when the temp sensor shows temperature below 40F in defrost mode. This may be due to a faulty defrost heater, control board, or fuse. Locate it: unplug the refrigerator and check these elements. The controller unit and control board relay need special attention. What to do about it: if one or more of these parts proves faulty, replace it. This may require a technician’s assistance. Why it happens: the pantry sensor may not be functioning properly. This may be due to short-circuit in the sensor or poor wiring. Locate it: check the sensor and the wiring. What to do about it: repair or replace the pantry temp sensor. Kenmore brand is owned by the company Sears. However, Kenmore refrigerators are manufactured by companies Amana, Frigidaire, GE, LG and Whirlpool. This is a respectable brand of refrigerators. 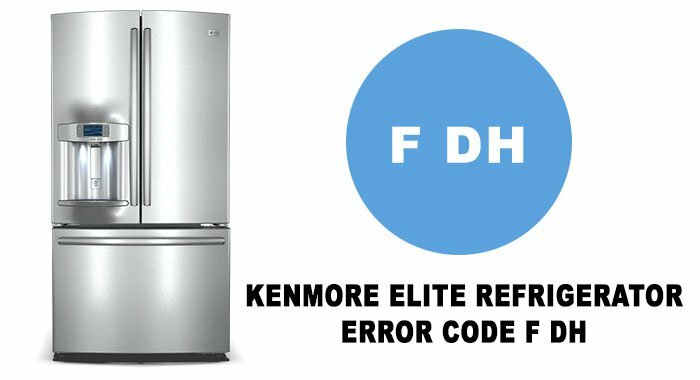 Below you will find a table of Kenmore refrigerator error codes. Freezer Sensor Error Er FS Short or Disconnection of Freezer Sensor Check each sensor and its connector. Abnormality of BLDC FAN Motor for Ice Making Er IF It is caused when feedback signal isn’t over 115 seconds during BLDC FAN motor operating Poor BLDC Motor connection, DRIVE IC, and TR Tx/Rx between ice maker and main board. Abnormality of BLDC FAN Motor for Freezer Er FF It is caused when feedback signal isn’t over 115 seconds during BLDC FAN motor operating Poor BLDC Motor connection, DRIVE IC, and TR Tx/Rx between icemaker and main board. Abnormality of BLDC FAN Motor for Mechanic Room Er CF It is caused when feedback signal isn ’ t over 115 seconds during BLDC FAN motor operating Poor BLDC Motor connection, DRIVE IC, and TR Tx/Rx between icemaker and main board. Communication Error Er CO Communication Error between Micom of Main PCB and Display Micom Poor Communication connection, Poor TR of Transmitter and Receiver Tx/Rx between icemaker and main board. Er rS Refrigerator sensor error Sensor and wiring and connectors Thermistor (temperature sensor), Wiring harness. ErlS Ice maker sensor Sensor short or wiring problem Ice maker assembly; the sensor isn't usually sold separately. Er FF(error solution Er FF) Evaporator fan failed Fan motor, control board, wiring harness Evaporator fan motor. Er CO (error solution Er CO) Communication error Communication error between main board and display board Display control board.